Organized(组织) by Chinese Embassy(中国大使馆) in Jordan in coordination with Talal Abu-Ghazaleh Confucius Institute(孔子学院) of Jordan, the "Ambassador's Cup" Chinese Calligraphy(书法) Competition(竞赛) was held here on Wednesday, attracting(吸引) dozens of Jordanian students studying Chinese language. 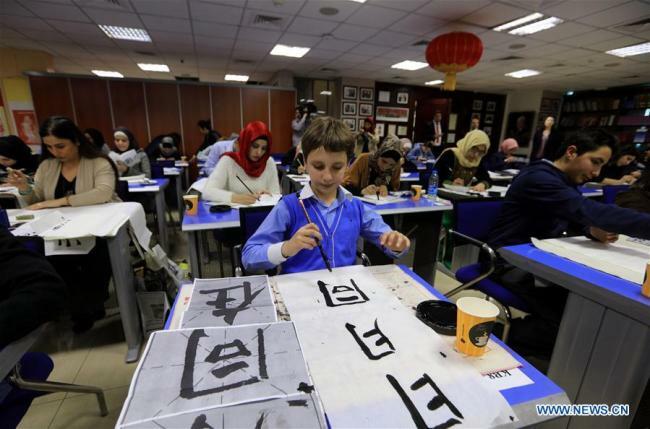 Competitors take part in(参加) the "Ambassador's Cup" Chinese calligraphy competition at Talal Abu-Ghazaleh Confucius Institute of Jordan in Amman, Jordan, on Feb. 7, 2018. We ought to organize more social events.